Introducing the Jaguar XE, a new compact executive saloon to rival the Audi A4, BMW 3 Series and Mercedes-Benz C-Class. Extensive use of aluminium means it’s a very light car – good for fuel economy, not so good for outfit matching ratios. So what are we looking for? Early reviews of the new XE have raved about its superb handling. 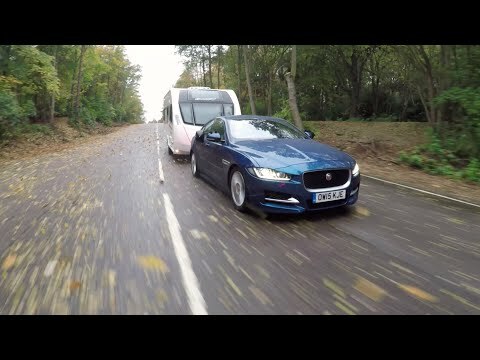 We want to see if the Jaguar is just as good at towing, and whether it is practical enough for caravan holidays. The XE has a kerbweight of just 1475kg. That gives an 85% match figure of 1254kg, although both major caravanning clubs advise that experienced drivers can tow caravans weighing up to 100% of a car’s kerbweight. That would still be on the right side of the law, because the Jag has a legal towing limit of 1600kg. We hitched up to a Swift Expression 554 with a Mass in Running Order of 1197kg. With 280lb ft of torque, the XE’s diesel engine coped quite easily with the Swift, so long as revs didn’t drop below 1500rpm. With tall gearing biased towards fuel economy rather than punchy acceleration, this meant we had to adjust our driving to use a lower gear than expected. Avoiding the flat response from very low revs, the Jag pulled the Swift from 30-60mph in a brisk 12.2 seconds. Once up to the legal limit, the Jaguar felt secure and stable. In fact, high-speed stability is the XE’s stand-out virtue as a tow car; in wet and breezy weather, the Jaguar felt unflustered. The XE also performed well in the lane-change test, changing direction eagerly and gripping hard on a wet surface. We felt a slight pull at the back of the car on the fastest runs, but nothing alarming. Our emergency stop test also took place on a wet track, so the stopping distance of 11.8 metres from 30mph is a reasonable one. The Jag took the hill-start test in its stride. The electronic parking brake held the car and caravan still, then released smoothly as we pulled away. Again, so long as we kept the revs above 1500rpm the XE pulled cleanly to the top of the 1-in-10 slope. We tried the same slope in reverse without any hint of an overheating clutch. In this specification, the Jaguar XE is a fantastic car on most roads. R-Sport trim comes with sport suspension as standard, which keeps the car under firm control. Switch the JaguarDrive Control system to ‘dynamic’ mode to sharpen the throttle response and add weight to the steering, and the XE is more rewarding than some sports cars on a twisty back road. In day-to-day driving, though, the sport suspension is too firm for comfort, so we’d recommend opting for an XE with the standard, softer suspension. We’re also disappointed by the XE’s refinement. The diesel engine is much noisier than the equivalent unit in the new Audi A4, and at idle we could feel some vibration through the seat and gearlever. The driver and front passenger have reasonable space, although in our test car headroom was limited by the sunroof. You sit low to the ground and it feels snug and sporty. ‘Snug’ is a polite way of describing the back of the Jaguar XE. If you rarely use the back seats it might not matter, but if you are looking at this as a family car then the shortage of space could be a deal-breaker. Head- and legroom are both in short supply, while the curve of the roofline means it’s easy to knock your head getting in and out, and once inside, adult passengers will feel hemmed-in. Most of the Jaguar’s rivals have relatively small boots, but the Jag’s is particularly compact. Many couples will easily fill it with holiday luggage; a family would need to travel very light. The Jaguar’s £32,000 list price is competitive and What Car?’s used car experts are predicting a healthy 48% return on the original price after three years and 36,000 miles. Fuel-efficiency is the XE’s forte, with a remarkable official combined figure of 75mpg. We doubt many owners will match that in everyday driving, but we saw 32.2mpg while towing, so fill-ups should be few and far between. If you’re looking at the XE as a company car, the 99g/km CO2 emissions figure means a 17% benefit-in-kind tax rate. The Jaguar XE has achieved a five-star rating from Euro NCAP. With sport suspension the XE’s ride comfort suffers, while refinement and interior space aren’t as good as expected. On the other hand, the Jaguar XE tows very well and is a pleasure to drive on the right road. With normal suspension the XE is a much better car – but it still won’t be a very practical one.